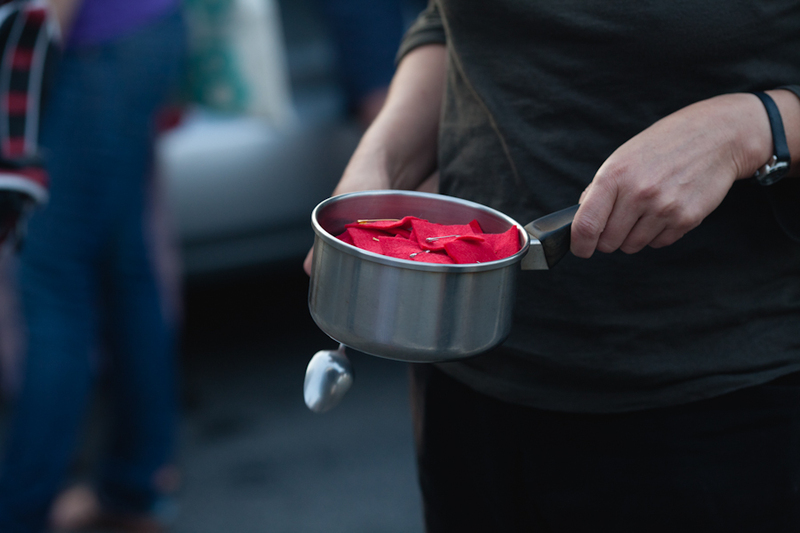 As I hold out my saucepan filled with red squares to passersby or folks who come out of their front doors to see the clanging, singing, dancing, and beautiful-sounding (and growing, with well over a hundred folks this time) band, people first hesitantly peer in and then their faces light up. If they are in support, of course. 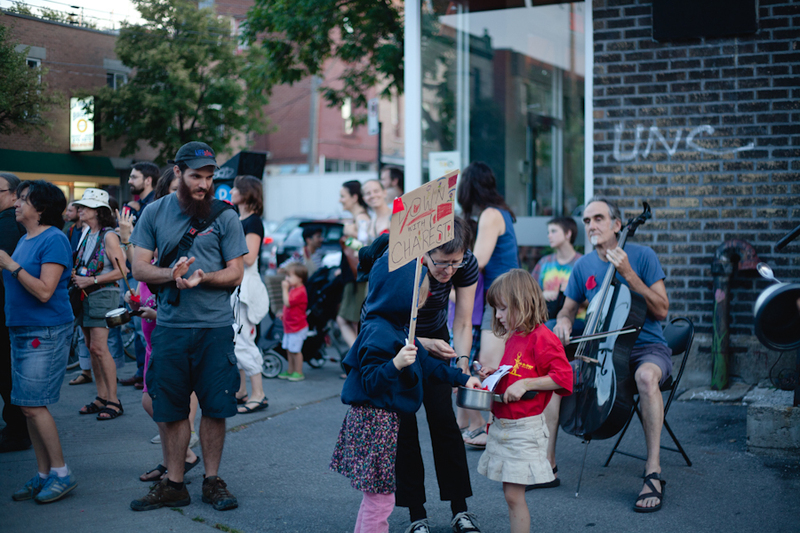 That’s usually a lot of people — except when we swing through the more upscale part of Mile-End. So many people are so appreciative and excited about getting this surprise gift as they are wandering down the streets when our ragtag solidarity march goes by. Others, strangely enough (or strange to me), ask me how much the squares cost, and then are overjoyed when I say, “Nothing! They’re a gift.” Last night, I must have given away some two hundred red-felt squares, and I can see — to my great joy — that people generally pinned them on their shirt or bag ASAP. And a multiple folks asked for me extras, for friends or to give out. One guy told me, “Great, a new one! I’ve given away about ten and figured I’d never be able to keep one of my own.” I told him to take about ten, which he did. I arrived home last night with maybe twenty squares left in the bottom on my pot, and sleepily put it aside, knowing that tomorrow I wanted to get more felt to make more squares. So this morning, when I emptied out the few remaining red squares in this saucepan before heading off to the fabric shope, I was surprised to find $6 in coins underneath–either from confused or kind people, and magically, just enough to buy another yard (at $6!) of felt today to cut out more red squares during tonight’s popular assembly in Mile-End. I’d been to this same fabric store before. The cashier is a talkative — really talkative — woman. But she didn’t seem to be there. Instead, a completely silent guy took the bolt of red felt from me, and without any words, cut the two yards I’d requested — since I figured, the more squares, the merry, and so why not double my good luck of last night’s donation with my own $6. He set my felt on the table and then, just as wordlessly, disappeared. This entry was posted on July 19, 2012 by Cindy Milstein in Dispatches from Quebec Spring.